What is a migrant? The simplest definition is a person who moves, either to another country or within their own. This report combines international migrants and people forcibly displaced from their homes but remaining in their country of birth to estimate the size of the total migrant population in the Middle East. (Internal migrants moving within their countries for reasons other than conflict – jobs, family and education – are not included in this report’s estimates because reliable data for this group in the region do not exist.) This approach provides a comprehensive view of the intensity of movement occurring in the region. Often, people cross international borders when migrating. Many of these international migrants move for job opportunities, to join family or to study. They are not forcibly displaced from their homelands, but voluntarily leave one country to live in another. But some international migrants move to another country to escape violence or persecution. These forcibly displaced persons (refugees and asylum seekers) also cross international borders. They are considered both displaced and international migrants. People also move inside their country’s borders when fleeing conflict. This report relies on data from the United Nations High Commissioner for Refugees that estimate the number of people who are internally displaced within their countries due to armed conflict, persecution, violations of human rights or natural disasters. This is an important group to include in the analysis of Middle East migrant populations since conflicts in Syria, Iraq and Yemen have displaced millions of people within their countries in recent years. The migrant share of national populations is not uniform across the Middle East. In 2015, among some of the Persian Gulf states, migrants make up an overwhelming majority of national populations in United Arab Emirates (88%), Qatar (75%) and Kuwait (74%). Most of these migrants are non-displaced, international migrants. The migrant share of the population is smaller but still substantial in countries like Jordan (41%), Syria (40%) and Lebanon (34%), with most being displaced migrants, of whom some were born in these countries and others have crossed international borders as refugees or asylum seekers. In some countries, migrants made up a much smaller share of national populations in 2015. Countries like Turkey (4%) and Iran (3%) have low shares of their populations that are either internally displaced persons due to conflict or international migrants, even though millions of migrants live inside their borders. Ever since the movement of Palestinians following the Arab-Israeli War of 1948 and establishment of the state of Israel, Palestinian refugees have lived in neighboring countries such as Jordan, Lebanon and Syria as well as within the Palestinian territories themselves. The total Palestinian refugee population, including descendants born outside of the Palestinian territories, was estimated to be around 5.2 million in 2015. Palestinian refugees are registered with the United Nations Relief and Works Agency (UNRWA), which assists with education, health care and other services for Palestinian refugees. As of Jan. 1, 2015, nearly 3 million Palestinian refugees were registered with UNRWA outside of the Palestinian territories. The figures in this report include these 3 million Palestinian refugees as displaced outside of their countries of birth, even though several generations of Palestinian refugees living in these countries were not born in the Palestinian territories. Palestinian refugees living within the Palestinian territories are not included in the estimates of this report. These refugees have not crossed international boundaries. For example, neither the United Nations High Commissioner for Refugees (UNHCR) nor UN migration statistics classify them as refugees or migrants. UNHCR also does not consider Palestinian refugees living within the Palestinian territories to be internally displaced persons. By the end of 2015, the Middle East was home to about 23 million displaced migrants – or about four-in-ten of all displaced people worldwide. Many of those displaced have fled armed conflict and are living either within their birth countries or in neighboring countries. In 2015, Syria (7.1 million) and Iraq (4.7 million) were home to the largest displaced migrant populations in the Middle East. Large numbers of displaced migrants were also living in Jordan (2.9 million), Yemen (2.8 million) and Turkey (2.8 million) in 2015. A majority (59%) of the Middle East’s growing population of displaced migrants never crossed international borders. 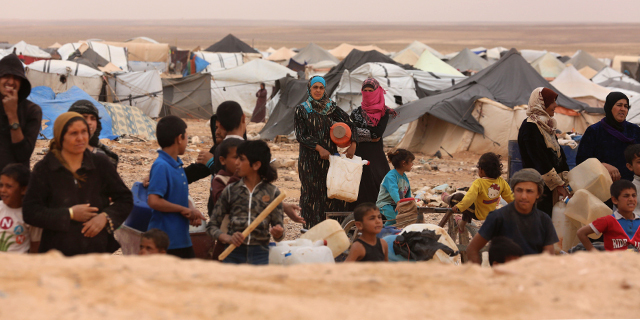 In 2015, more than 6 million of the total 7.1 million displaced migrants in Syria were Syrian born. Similarly, more than 4 million of Iraq’s 4.7 million displaced migrants were Iraqi citizens who were forcibly relocated within their home country. In 2015, about four-in-ten (41%) displaced migrants in the Middle East lived in a foreign country,2 amounting to nearly 9.6 million people. Fully 85% of this group in 2015 was located in just four countries: Turkey, Jordan, Lebanon and Iran. About half (47%) of these international migrants were Syrian citizens (4.6 million) and about a third (34%) were Palestinian refugees as of 2015. But more than a million refugees from Afghanistan also live in the Middle East, mostly in neighboring Iran. In addition to displaced persons, a substantial portion of the Middle East’s surging migrant population is made up of manual laborers and professionals relocating to the oil-rich countries of the Persian Gulf from other countries, many in pursuit of economic opportunity. Between 2005 and 2015, the number of non-displaced, international migrants in the Middle East increased from roughly 19 million to about 31 million. Even as the absolute number of non-displaced, international migrants in the Middle East climbed between 2005 and 2015, their share of all migrants in the region declined due to the surge of displaced persons. Over the 10-year span, the portion of all migrants living in the Middle East who were non-displaced, international migrants fell from 78% to 57%. As of 2015, the countries with the largest number of non-displaced, international migrants in the Middle East were Saudi Arabia (10.2 million), United Arab Emirates (8.0 million), Kuwait (2.9 million) and Oman (1.8 million). Notably, there are indications that job growth is slowing in Persian Gulf countries as oil prices remain below recent highs. Thousands of migrant workers in the region are unemployed, leading to a decline in migrant remittances from the Gulf. Indeed, the situation in the Gulf helps to explain why the total value of remittances across the globe fell in 2015 for the first time since the end of the Great Recession. Israel is another top destination for non-displaced, international migrants in the Middle East. It has a long history of international migrants entering its borders, not only because of job opportunities there but also to repatriate Jews to the world’s only Jewish state. The growth of its foreign-born population between 2005 and 2015, however, is far behind the region as a whole, up just 4% over the period. About 2.0 million migrants live in Israel, making up about a quarter (24%) of the country’s overall population. The “Middle East” in this report includes 16 countries and territories: Bahrain, Egypt, Iran, Iraq, Israel, Jordan, Kuwait, Lebanon, Oman, the Palestinian territories, Qatar, Saudi Arabia, Syria, Turkey, United Arab Emirates and Yemen. “Migrants” includes people moving across international borders for whatever reason (including refugees and asylum seekers and other international migrants), as well as people forcibly displaced from their homes but remaining inside their country of birth (internally displaced persons). 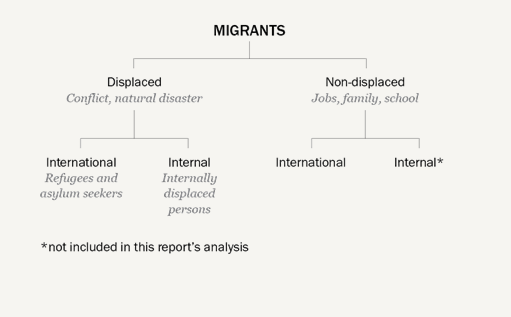 This definition of migrants differs from previous Pew Research Center reports, in which “migrants” refers to international migrants and not include people internally displaced within their countries due to conflict. “Displaced migrants” are those who have been forcibly displaced from their homes mainly due to conflict or natural disaster. Most displaced migrants in this report have moved due to conflict. Displaced persons can remain in their birth countries (see “internally displaced persons” below) or cross international borders (see “refugees and asylum seekers” below). “Internally displaced persons” (IDPs), as defined by the United Nations High Commissioner for Refugees (UNHCR), are people who have been “forced to leave their homes or places of habitual residence, in particular as a result of, or in order to avoid the effects of armed conflict, situations of generalized violence, violations of human rights, or natural or man-made disasters,” yet remain inside their countries of birth, not crossing any international borders. “Refugees” and “asylum seekers” are people who have crossed international borders to receive protection from persecution, war or violence. These populations remain refugees or asylum seekers until they are permanently resettled outside of their birth countries or return to their homelands. This report also includes Palestinian refugees living outside of the Palestinian territories (in Jordan, Lebanon and Syria), but not Palestinian refugees living within the Palestinian territories (see “Palestinian refugees” text box for more information). “Non-displaced, international migrants” are those who have not crossed international borders due to conflict. Non-displaced, international migrants are the remaining population after displaced migrants are removed from the total foreign-born population provides by the United Nations. Most non-displaced, international migrants entered the Middle East for economic opportunity, but some may have moved for other reasons including to join family or to study.